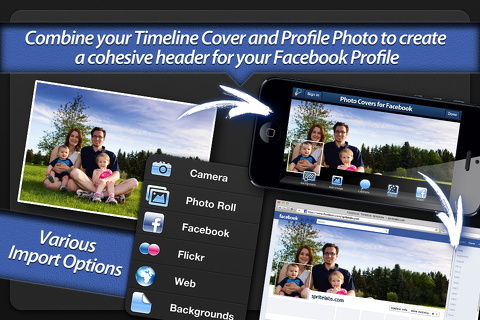 Add photo effects, text, and collages to your Facebook cover photos and profile pictures with the Photo Covers for Facebook iPhone, iPod Touch, and iPad app. With the use of straight forward, efficient interface, you use intuitive gesture controls introduced in a nice video tutorial to finesse your Facebook account. The Photo Covers for Facebook iPhone app operates in a landscape view that complements the size and shape of your Facebook cover photos. The screen has four simple options including frames, create your own, Facebook connect, and Facebook like. You touch an option, then you move to a new screen to continue. If you do not connect with Facebook from the home screen, you will be prompted to do so when access is needed at the appropriate time. The frames option has a selection of 19 frames that include themed collages. If you take a trip to the beach or want to express your love for your new dog, then you may find a suitable option. The photo frames generally lean in a cheesy direction, but there is a market for cheesy. I would recommend adding additional frame and collage options that would have more modern, sophisticated vibes to increase appeal. 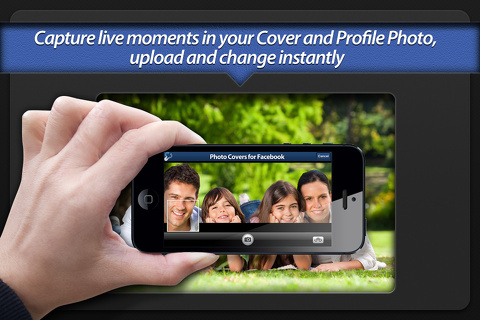 The create your own option gives you the chance to create your Facebook cover and profile in the same interface. You simply touch the cover photo area to select a photo from the in-app camera, iPhone photo roll, Facebook, Flickr, web, and backgrounds. Again, the backgrounds are limited in graphic appeal and scope, but most people will be compelled to post a photo. You tap your selection, and it appears in the cover photo area. You can resize and position the photo by pinching, expanding, and swiping with your finger. You can create a mirror image with just a tap on the triangle icon on the image. The gesture controls are agile and effective. You can touch the magic wand icon to open the photo editing options menu bar at the bottom of the screen. The editing options include the chance to add an effect, text, caption, or an additional image. There are more than 30 effects that pop up in a menu bar above the editing tools that are accessed with horizontal swipes. If you add text and captions, the interface includes a keyboard and allows you to change the size of the font by swiping a volume-style control. The chance to add another photo that you can position on the screen and add effects is an unexpected way to enhance your cover photo. You can use all of these same tools for your profile photo as well. With a touch to save to Facebook, the Photo Covers for Facebook iPhone app updates your account. An amplification of the graphics would make it extremely appealing, and it would also lend itself to a business version. Businesses would love to update their cover photos with new merchandise, services, and sales in a way that creates brand cohesion. The Photo Covers for Facebook iPhone, iPod Touch, and iPad app is a $1.99 download from the iTunes App Store. AppSafari review of Photo Covers for Facebook was written by Jenni Ward on March 7th, 2013 and categorized under App Store, iPad apps, Photos, Social, Universal. Page viewed 3962 times, 1 so far today. Need help on using these apps? Please read the Help Page.